The area around Afsaal is one of the best places in southern Kruger to see lion. Look out for the big cats in the vicinity of Makhutlwanini Koppies, just north of the picnic spot on the tar road to Skukuza (H3). North of Afsaal, the H3 descends into Biyamiti basin woodlands, winding through dense, riverine bush in the floodplains near Jock's Camp. The Biyamiti rarely flows all year round, and to a limited extent, bird and game spotting is dependent on how plentiful water is. During dry years, animal life becomes more concentrated along the watercourse. The Biyamiti River bridge is usually an interesting place to stop. In summer, there are sometimes large colonies of Red-billed Queleas nesting in the dense pockets of thorn trees close to the river bank. Their presence attracts raptors such as the African Goshawk and Steppe Eagle. Red-billed Queleas are the most common bird species in Kruger, making up well over half the avian biomass in the Park. They are more often seen in the central grasslands than in the south. Flocks consisting of tens of thousands of birds move around the subcontinent in search of food, often clustering gregariously at water sources after rain. They are regular prey for almost all of the raptors as well as hornbills, egrets, herons and the Marabou Stork. North of the Biyamiti valley, the landscape opens up into stretches of grassland savanna. Southern White-crowned Shrikes are often seen along this section of the H3. The water hole of Muhlambamadvube (Zebra Pan) was used as a campsite by Carolus Trichardt who opened up the Delagoa Bay road in 1845. A good birding spot is along the Kwaggaspan wetland before the Renosterkoppies turn-off. If there is a surge of rodents in the Park, one is sure to see Black-shouldered Kites here in summer. There is a large vlei to the west of the road which attracts a lot of wetland migrants. One of Kruger's more common larks, the Flappet Lark (approximately 130 000 breeding pairs in Kruger), can be seen in these grasslands. Look for it along the drainage lines and lower contours of grassland pockets within mixed woodland. It's easily missed because of its drab colouring. The Flappet Lark takes its name from its habit of beating its wings together noisily, particularly during courtship and territorial displays. Some ornithologists believe that its wing flapping is displacing the function of its song. 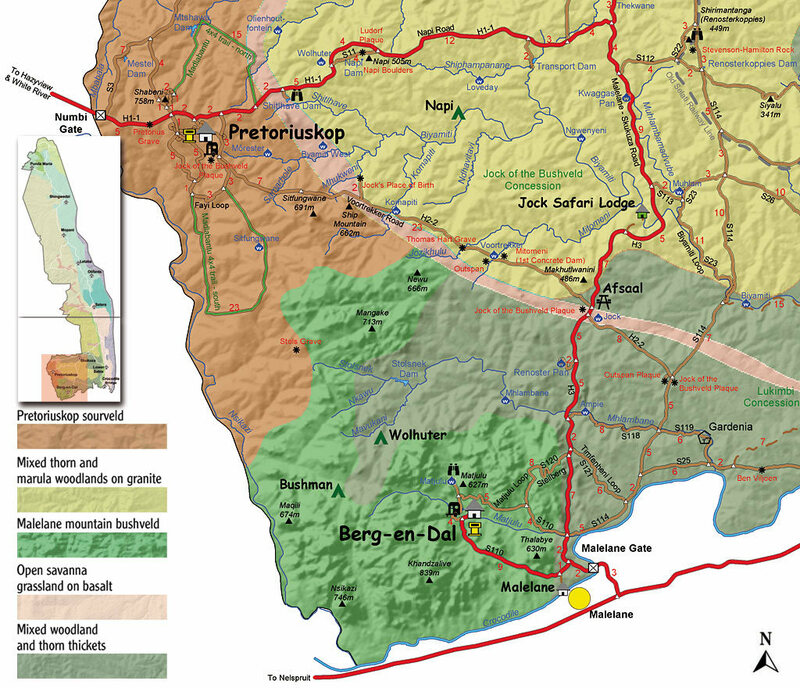 Just north of the Renosterkoppies turn-off (S112), the H3 joins the Napi Road (H1-1) which is the main road between Skukuza and Pretoriuskop. From here northwards, thorn thickets replace the mixed woodlands. The giant, granite dome of Mathekenyane, just off the H1-1, is one of a series of inselbergs that run from west to east across the lowveld floor. It is a perfect vantage point for the whole of southern Kruger and is particularly dramatic in spring when the Knob-thorn woodlands below are in full creamy-white flower. To the west are the clearly identifiable koppies of Legotote, Ship Mountain and Pretoriuskop with the escarpment rising behind them. To the south-east lies the prominent huddle of the Malelane mountains, while the clearly visible Lebombo ridge marks the eastern horizon and the border with Mozambique. The thorn thickets become very dense along the H1-1 as one gets closer to Skukuza. Tree size increases and the birdlife gets busier nearer the river. The ever-present Bateleur is seen all year round, while Wahlberg's Eagle is probably the most commonly seen summer raptor. The Dark Chanting Goshawk often perches prominently in the denser stands of red bushwillow along the roadsides. One of Kruger's most secretive raptors, the Little Sparrowhawk, is known to hunt in the thicker woodlands around Skukuza, although it is associated more with the north of the Park. Other birds to look out for are the Black-bellied Bustard* and the Striped Kingfisher. 'Kingfisher' is something of a misnomer for this bird, which is often found quite far from water. It doesn't eat fish. Its diet consists mostly of grasshoppers and beetles, with an occasional lizard or small snake. Jock's Safari Lodge sits on the edge of the Biyamiti flood plain, between the Biyamiti River and the usually dry Mitomene stream. Summer birding is particularly good in the 6 000ha concession because it straddles the Biyamiti watercourse, which is rich with kingfishers and cuckoos. The piercing cry of the Woodland Kingfisher is a characteristic summer sound in the Biyamiti woodland. Named after the legendary terrier Jock of the Bushveld, the luxury private camp has 12 units, each with its own tsala (private deck) and plunge pool, overlooking the riverbeds. There is a statue near the entertainment area of Jock fighting a sable antelope. A number of the original 19th century transport wagons are parked under the groves of tall Ebony Jackal-berries, Weeping Boer-beans, Cape-ash and Natal-mahoganies. These trees provide fine nesting holes for Crested and Black-collared Barbets, which can get quite aggressive with each other over nesting site claims in breeding season. Both species engage in lively duets with their mates. The Black-collared Barbet has the famous 'two puddly' duet in which the first bird starts the duet with a skzz and a two to which its mate then responds with a lower pitched puddly , a cycle which can repeat itself 20 times over. A huge old Jackal-berry dominates the main entertainment area of Jock's. The outside deck and bar are designed around the tree which is reputedly over 400 years old. From the deck, there is a good lookout over the river, grasslands and Knob-thorn woodlands which are mixed with Magic Guarri and Black Monkey-orange (Strychnos madagascariensis) trees. Although the Black Monkey-orange can be poisonous to humans if eaten unripe, it is readily consumed by browsers such as kudu, elephant, baboons and even eland. Rhinos can sometimes be seen from the entertainment area. The prominent outcrop of boulders to the east of Jock's has rock paintings and artifacts that indicate human settlement here dating back thousands of years. A guided walk to the rock outcrop is favourable for sightings of the Orange-breasted and Grey-headed Bush-Shrikes which are camp specialities. From the private suites one looks out over reed beds where there are active parties of Thick-billed Weavers, White-winged Widowbirds and Southern Red Bishops, while Woolly-necked Storks often appear on the sandbank to the north of the camp. There is usually a profusion of swallows and swifts over the floodplains during summer. A Barred Owlet has been known to nest in the camp.